Millions of Americans suffer from joint pain, with 40 percent saying that it is “very difficult” or they are “unable” to perform common activities like stooping, bending, kneeling or walking a brief distance, according to the Centers for Disease Control and Prevention. A partial joint replacement from a Jacksonville orthopedic specialist may significantly decrease pain and improve your quality of life. What’s the Difference Between Partial Joint Replacement and Total Joint Replacement? In a total joint replacement, an artificial implant replaces the entire damaged joint. This is most common when there is severe damage to the joint, as in rheumatoid arthritis, severe osteoarthritis or avascular necrosis. In some cases, the orthopedic surgeon must completely open the area surgically to perform a full joint replacement, making it a more invasive procedure. Partial joint replacement, on the other hand, is a minimally invasive approach to decreasing pain associated with joint damage. In this procedure, the orthopedic surgeon’s goal is to retain as much healthy joint tissue as possible. Thus, only the damaged or diseases portions of the joint are removed and replaced. This is a more conservative approach than full joint replacement and may result in more positive outcomes, depending on your unique situation. When only one side of the knee is damaged, a partial knee replacement (sometimes called a unicompartmental knee replacement) may be warranted. This procedure is less invasive and results in a shorter recovery time for patients. 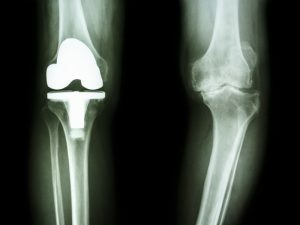 However, those with advanced arthritis that affects much of the knee joint may not be good candidates for the procedure. The hip is a ball and socket joint, with the head of the femur fitting into the acetabulum, a portion of the pelvis. Full hip replacement involves replacing both the head of the femur and the surface of the acetabulum with an artificial implant. In contrast, a partial hip replacement typically involves only the head of the femur, leaving the natural tissue of the pelvis intact. Resurfacing the shoulder joint retains as much healthy tissue as possible. This procedure involves replacing the head of the humerus (the upper arm bone) with an implant. Shoulder resurfacing often reduces pain and increases mobility. For individuals with wrist pain or damage, a partial wrist fusion may be beneficial. This involves fusing some of the wrist bones together, which enhances stability of the joint. To learn more about whether a partial joint replacement is right for you, contact your orthopedic doctor today.